It used to be the case that segregated waste recycling was predominantly an “inside activity while in ‘the great outdoors’, waste was called ‘litter’, was mixed and destined for landfill or at best an EfW (Energy from Waste) scheme. 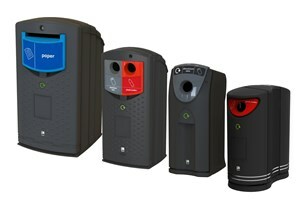 There is a plethora of ‘inside’ waste receptacles, purposely designed for segregating virtually any waste stream, as a look at the Merlin web site (https://www.merlin-industrial.co.uk/environmental/recycling)will confirm. However, in the recent past, Leafield has noticed an increase in organisations, education establishments, retail parks and even Local Authorities prepared to organise and support external recycling schemes. In many instances, especially those ‘on the high street’ the segregation is basic and falls into two streams… dry mixed recyclate for processing in MRFs (Mixed Recycling Facilities) and general waste, headed potentially for landfill or incineration. However, more and more organisations, especially universities and higher education establishments are more aware of the environmental implications and are realising the financial benefits to be had from segregating waste at source. In the worst-case scenario, dry mixed recyclate is less expensive to dispose of than general waste, but by astute segregation cans, bottles, cups, food etc., an organisation can turn a cost into an income stream. To assist in the process, Merlin can supply a selection of stylish yet functional external recycling bins, ranging from the 130 litre Pioneer and 140 litre Envirobanks, to the generous 240 litre Envirobanks with a capacity to meet the demands of the busiest public areas. 180 litre, double aperture, TwinBins are proving popular with Councils from Hackney to Westminster City. As with all Leafield external recycling bins, a choice of colour coded apertures, conforming to WRAP guidelines is available along with graphics to highlight the waste stream to be collected. The aperture shapes are appropriate for collecting most commonly found street-side waste streams. All of these bins are rotationally moulded in UV stabilised polyethylene for ultimate strength and long-term durability.